Background: Thyroid disorders are amongst the most common endocrine diseases in India. Numerous studies from various countries differ in their prevalence estimates for both hypothyroidism and hyperthyroidism. There is however a paucity of data from the rural areas. The present study was conducted to find out the prevalence of thyroid disorders among the people of Wardha district of Maharashtra. 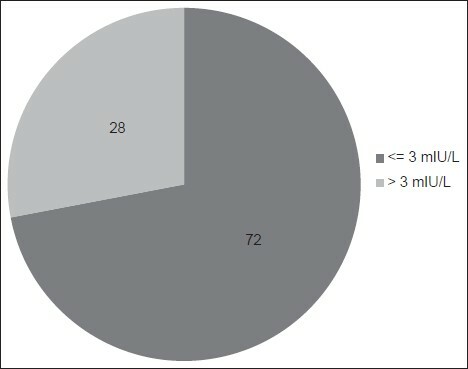 Materials and Methods: This is the observational, retrospective study conducted in Acharya Vinobha Bhave Rural Hospital, Sawangi (Meghe), Wardha. In total, 1905 patients visiting to hospital and suspecting of thyroid disorders were screened for thyroid function. Thyrotrophin (TSH), free triiodothyronine (FT3), and free tetraiodothyronine (FT4) in human serum were quantitatively estimated by a microplate immunoenzymetric assay. 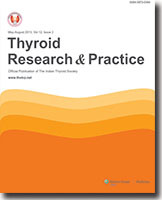 Results: Of the 1905 total subjects in the age range 10-80 years, 35.7% had thyroid dysfunction and 64.3% had euthyroidism; 21.7% had hypothyroidism (6.9% clinical, 14.8% subclinical); 2.3% had hyperthyroidism (1.1% clinical and 1.2% subclinical), while 11.6% had mildly suppressed TSH with normal FT4. 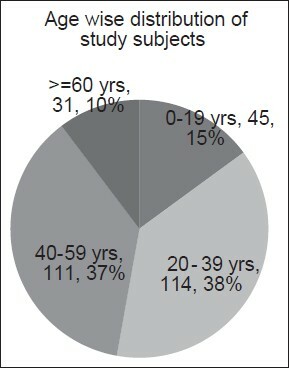 Conclusion: The prevalence of clinical (75%) and subclinical hypothyroidism (71%) and clinical (66%) and subclinical (70%) hyperthyroidism was high in the 21-50 year age group with decreasing trend towards end. Also, the prevalence of mildly suppressed TSH was high in the 21-50 year age groups, which is 65%. This means that major burden of thyroid disorders is on reproductive age groups. This problem must be addressed immediately to avoid deleterious effect of abnormal thyroid dysfunction on the patients as well as on their offspring. Gestation is the period when the thyroid function parameters undergo several changes. As the range of thyroid hormone levels differ in the gestational period due to the various physiological changes, the hormonal range, which is used for the normal population cannot be used for pregnant women. Our study was done to find the thyroid status of pregnant women by comparing the trimester specific range as published by American Thyroid Association (ATA) guidelines with the normal population/laboratory reference range. A total of 377 patients with a distribution of 110,149 and 118 among the trimesters were studied. One patient each in first and second trimester had overt hypothyroidism when trimester specific reference range as published by ATA was followed. The prevalence of subclinical hypothyroidism as per ATA guidelines were 34.4, 31.5 and 30.5%, in the respective trimesters. 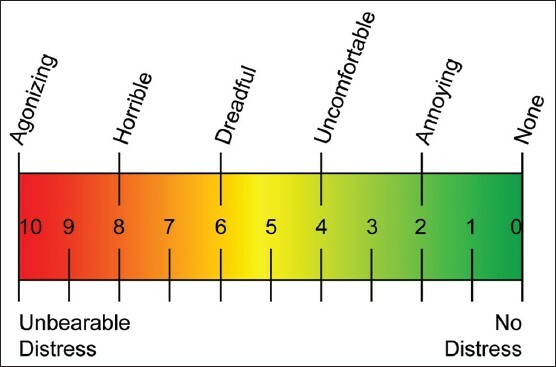 The prevalence of subclinical hypothyroidism on taking into account the normal laboratory reference range of 3.6, 2.6 and 6.8% in the respective trimesters. Overt hypothyroidism was seen, one each in the first and second trimester and 29.3% were misdiagnosed as normal patients in this study. It is inferred that large number of patients will be misdiagnosed as having normal thyroid function during pregnancy if the trimester specific reference range is not followed. Thus we conclude that the pregnancy reference range should be used to interpret the thyroid hormones in pregnancy to avoid the misdiagnosis, as thyroid hormones are necessary for the normal fetal brain development. ANCA-associated vasculitis is a rare side effect of commonly used thionamide group of anti-thyroid drugs. It is most commonly associated with use of propylthiouracil and p-ANCA positivity. However, rarely it has been reported with carbimazole exposure and c-ANCA positivity. 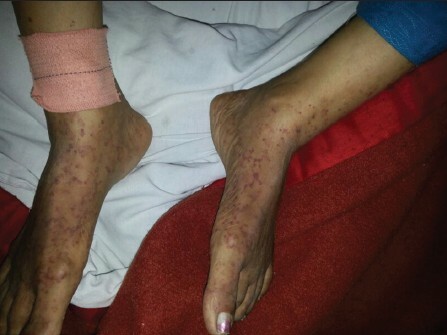 Here we report a case of life-threatening episode of c-ANCA-associated vasculitis in a female patient of Graves' disease on exposure to carbimazole, who was managed successfully by discontinuation of carbimazole and immunosuppressive therapy. A high index of suspicion is required for diagnosing such cases, who if not diagnosed correctly, may have adverse outcome. Rituximab is a monoclonal antibody directed specifically against the CD20 resulting in depletion of B lymphocytes. Rituximab is used in multiple autoimmune disorders across the medical specialties including multiple sclerosis, myesthenia grevis, rheumatoid arthritis and inflammatory bowel disease. In the field of endocrinology, rituximab is indicated specifically in resistant cases of Graves' opthalmopathy. We recently encountered a patient of multiple sclerosis, developing features of destructive thyroiditis after a course of rituximab and report the same here. Primary hemangioma of thyroid gland is a rare entity. Preoperative diagnosis of primary thyroid hemangioma is difficult. High level of suspicion is required if the preliminary investigations are inconclusive. We here present a case of 62-year-old female who presented with a left-sided thyroid swelling with a preoperative diagnosis of colloid goiter and was diagnosed as hemangioma after surgery. 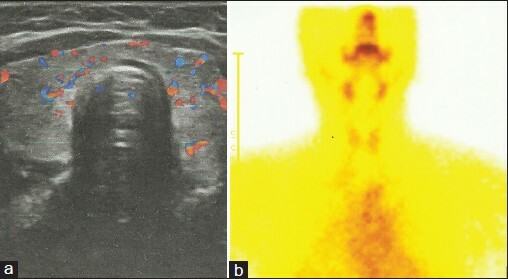 Warthin-like variant of papillary thyroid carcinoma (PTC) is one of the several variants of papillary thyroid cancer. 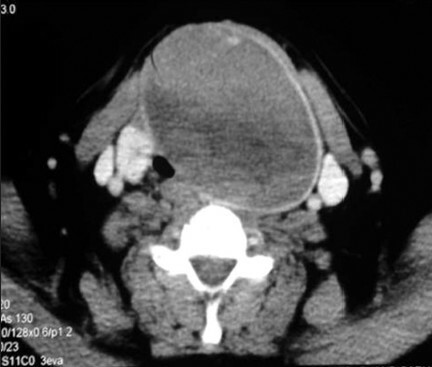 A 36-year-old female came with history of thyroid swelling. Ultra sound showed a solid nodule in the right lobe. 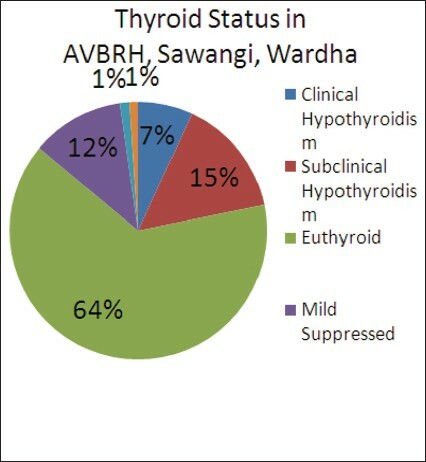 Thyroid profile was within normal limits. 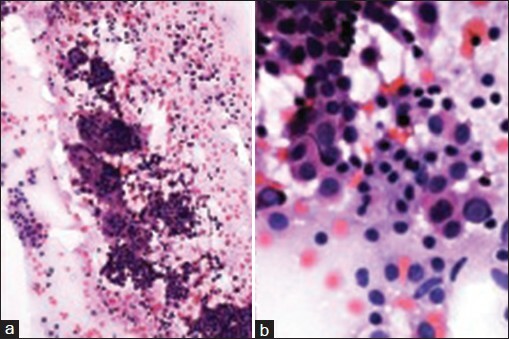 Fine needle aspiration cytology (FNAC) revealed papillary carcinoma in a background of lymphocytic thyroiditis. Patient underwent thyroidectomy. Histopathology proved it to be Warthin-like variant of PTC with nodal metastasis. This uncommon variant behaves in an indolent fashion. However, our case is unique as it showed nodal metastasis. Cytodiagnosis is challenging with rare reports of cases diagnosed on FNAC. Herein we document cytomorphology of this uncommon variant reported at our institution.